A limited edition of 5,000 this proof condition coin depicts a color image of actor Avery Brooks as he appeared as Captain Ben Sisko in Star Trek: Deep Space Nine, against a representation of the space station Deep Space 9. Star Trek series set primarily on a space station—one built by an alien race, no less. Voyager before it was transported deep into the Delta Quadrant. Star Trek: Deep Space Nine set itself apart with season-spanning story arcs and character-driven plots that resonated with Canadian fans! U.S.S. Enterprise NCC-1701 Crew 2oz Silver Proof Coin. The Perth Mint will release no more than 5,000 of the 2016. The coin is struck by The Perth Mint from 2oz of 99.9% pure silver in proof quality. Note 7: Ensign Pavel Chekov and the U.S.S. Enterprise NCC-1701™150 mm x 70mm. Country of Issue – Niue. STAR TREK: THE ORIGINAL SERIES 2018 Niue 5g silver note set: The hardcover. These striking 5g pure silver coin notes feature collaged images of the iconic characters from the TV series. Star Trek ! Made for the fans! An unforgettable addition to any collection, and an original gift that will be treasured and valued by the Star Trek fan in your life! 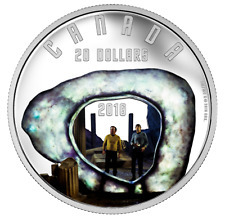 Your coin design recreates a key scene from the 1967 Star Trek episode. Star Trek ! Star Trek 's vision of the future is one brimming with optimism: where cross-cultural cooperation has brought us together and placed an emphasis on humanity's best attributes, while technological progress has made it possible for us to reach for the stars. A limited edition of 5,000 this proof condition coin features Deep Space 9 against a colored space background. A GREAT GIFT FOR ANY COLLECTOR ! 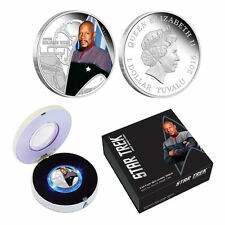 Great Coin for a Topical collection & TREKIES alike. Only one coin left ! Portrayed by actor Leonard Nimoy, the half-Vulcan, half-human Spock is renowned for his steadfast adherence to logic over "illogical" emotional responses. Artist: Susanna Blunt (obverse). Finish: proof. On the left side is a portrait of Communications Officer Nyota Uhura (portrayed by actress Nichelle Nichols) in a red uniform as she holds the scientific device designed for data sensing and analysis: the tricorder. U.S.S. Enterprise NCC-1701-D is brought to life by a vibrant color application on your coin. The obverse features the effigy of Her Majesty Queen Elizabeth II by Susanna Blunt. Equipped with a host of sophisticated weaponry including 12 phaser arrays, 250 photon-torpedo bays and a high-capacity shield, the. Star Trek Nemesis DVD Promotional Collectible Coin RARE 2003 Enterprise Sci Fi. Condition is Used. Is what it is? We prefer to ship priority for the insurance and ease of combined shipping? But will consider other options. Set against a backdrop of a colorful glow-in-the-dark nebula and a ringed planet. Your coin features a rich application of vibrant color that captures the imaginative spirit behind Star Trek: Voyager and the entire Star Trek universe. Star Trek: Enterprise (2001-2005). This glow-in-the-dark coin is a collectible tribute to one of the most famous vessels in Starfleet history Star Trek: Enterprise is set against a colorful, glow-in-the-dark nebula that infuses the scene with energy and motion. Country of Issue – Niue. STAR TREK: THE ORIGINAL SERIES 2018 Niue 5g silver note set. STAR TREK: THE ORIGINAL SERIES 2018 Niue 5g silver note set: The hardcover. Star Trek: The Original Series collector’s album (this is not included with any other note except the first - Captain Kirk). Eye-catching combination of a colorful image set against a close-up of the Borg cube's exterior—all engraved in incredible detail! TM/MC ", "CANADA" and the year "2017", all engraved in a. Star Trek fans: it's the exterior of a Borg cube vessel, whose ominous appearance strikes fear in the hearts of characters and viewers alike. Star Trek character with famous Trek technology. To the left is a portrait of First Officer Spock (portrayed by actor Leonard Nimoy) wearing a blue Starfleet uniform and in a state of alert, as he points his phaser pistol toward an unseen threat. The colorization is precision-printed using a revolutionary new technique; it the highest quality in the world. TM & © 2017 CBS Studios Inc. STAR TREK and related marks and logos are trademarks of CBS Studios Inc. Note 6: Lieutenant Hikaru Sulu and the U.S.S. Enterprise NCC-1701™150 mm x 70mm. Country of Issue – Niue. STAR TREK: THE ORIGINAL SERIES 2018 Niue 5g silver note set Spock & Chekov. STAR TREK: THE ORIGINAL SERIES 2018 Niue 5g silver note set: The hardcover. The bill honors the 50th anniversary of Star Trek. The legendary cult series first aired on NBC on September 8, 1966. Star Trek is one of the most popular TV series in history. Several Star Trek movies have also been made. The Trouble with Tribbles episode of. The Trouble With Tribbles. Enterprise 's Tribbles, which were transported to "where they'll be no tribble at all.". Star Trek community. Engraved in a special. 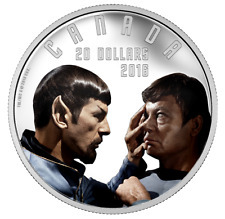 It took eight different takes to capture the avalanche of Tribbles depicted on the coin's reverse. Minted in 1993 by The Franklin Mint. Silver round contains 20.6 grams of. 925 sterling silver. Vintage 1975 Star Trek Mr. Spock bank Paramount Pictures complete with stopper. Vintage 1975 Star Trek Mr. Spock bank Paramount Pictures complete with stopper. See photos no breaks he looks fresh for 44 years old. Item will be packaged carefully and shipped promptly to the new owner. Thank you for taking a moment to look at our listing. Obverse — Features a official logo with the the legend: "Starfleet Academy Graduate.". Starfleet Academy. San Francisco MMCLXI (2161 — the year Starfleet Academy was created and the United Federation of Planets was founded.). Note 5: Lieutenant Uhura and the U.S.S. Enterprise NCC-1701™150 mm x 70mm. Country of Issue – Niue. STAR TREK: THE ORIGINAL SERIES 2018 Niue 5g silver note set: The hardcover. These striking 5g pure silver coin notes feature collaged images of the iconic characters from the TV series. Lighted Transporter Machine | 1,500 Minted. Collectible Coin and Currency. COIN HAS SCRATCHES ON THE CLEAR SHELL CASE . This is for 4 Star Trek related coins. 1985 gold, green and purple aluminum coins are titled Space The Final Frontier and show the Enterprise and the moon landing. 1987 purple aluminum coin shows William Shatner. Long out of production! Originally sold on QVC. Star Trek 25Th Anniversary Coin. One side features The Enterprise. SIngle Coin from a 12 coin set issues by franklin mint in 1993. see picture for the coin you will recieve.